What Is the Registration Act? Finally becoming a home-owner is a proud moment for many. After being a tenant all your life, putting your hard-earned money into a slice of property you can call your own is truly a memorable moment. However, the actual purchase of your property isn’t the final step of the process. Unless you register your new property, you won’t be granted any legal rights over it. In addition to other taxes and duties levied on home owners, property registration is one of the most important steps to take after purchasing property. Registering your property is essential in order to avoid any legal disputes and give you full control over what is rightfully yours. If you’re unsure how to go about registering your new property, here’s everything you need to know. The Registration Act of 1908 covers the whole of India except the state of Jammu and Kashmir. This act ensures that all the documents related to the property are legitimate and that the ownership of the property doesn’t come into dispute. Registering your property under this act is important because it helps conserve the property ownership details and will help your case in the event of a property dispute. Since registration of property comes under state legislation, the procedure depends upon your state government. However, most states have now introduced a computerised process to register your property. This move comes as a sigh of relief to property owners because it simplifies the whole process. 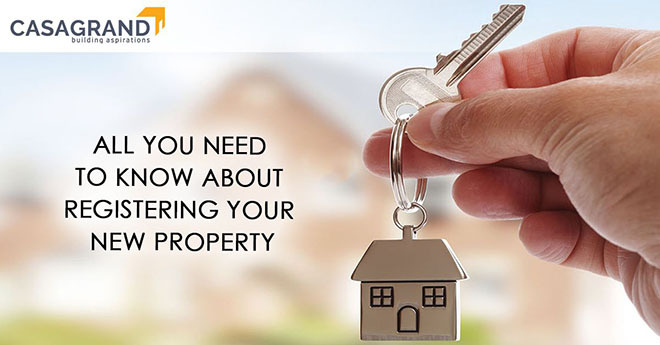 While in the past, you would need to go through a mountain of paperwork and many middlemen in order to register your property, now you just need a form you can download online. However, the entire process can’t be completed online. After filling out the form, you will need to manually submit it to the sub-registrar of your area. Before you can get your property registered in your name, you will need to obtain verification documents for the property. Property buyers generally come under two categories: those who purchased the property directly from the developer and those who purchased the property from the previous owner. If you fall under the first category, your property developer needs to provide you with all the verification documents. If yours is a secondary sale, then contact the previous property owner for all the verification documents. Verification of the title of the property is important to ensure that there is no fraudulent property being registered. If you’re a first time home buyer, here are a few ways to ensure that the property you’re buying is legally clear. Stamp duty is a form of tax that is levied when you register your property. This tax comes under the ambit of the state government, so the amount payable as stamp duty varies between different states. Generally, however, stamp duty is derived from the total value of your property. This is why you need to get your property valuation done before you can pay stamp duty. Most states have a higher stamp duty for properties in urban areas as compared to ones in rural locations. They also have a lower stamp duty for women to encourage them to become property owners. You can purchase stamp papers from a verified vendor or download e-stamp papers online. Preparing the sale deed is one of the many reasons why you need to hire a good lawyer to make the registration process much easier for you. Your attorney will frame a sale deed on your behalf and have it printed out on the stamp papers. The content of the sale deed will depend upon what kind of transaction you’re performing; whether it’s a lease, mortgage or sale. Apart from these important documents, you will also need to consult with your lawyer if there are any additional documents applicable to you. Once you have all your documents ready, you will need to approach the sub-registrar to complete the registration process. You will need to bring with you two witnesses who also have their ID proof with them. Bring the original copy of the title deed along with two photocopies of it as well. The sub-registrar will verify all your documents and complete the registration process. They will return the verified documents to you while keeping the copies with them. Once you have successfully registered your property, it is indisputably your own. Every homeowner needs to complete the registration process to protect their claim over their property. Once you understand the process, it’s really not complicated at all. So don’t let the thought of going through this procedure deter you from becoming a proud homeowner. Visit Casagrand and find beautiful homes you’ll want to call your own.